I for one have greatly benefited from your TBK Tracker and Tracker.Net products. Thank you. I also recommend Tracker.Net. We use it with over 6,000 employees and Jeff's support is top-notch. 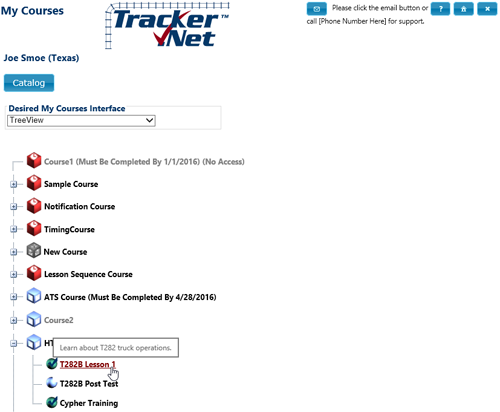 For a low budget alternative, I strongly recommend Tracker.Net as the LMS. A simple setup, easy to learn how to use, and I have not found any flaws in its SCORM abilities with regards to ToolBook content deployment. I can only speak from personal experience about the LMS I use. I use Tracker.Net from Platte Canyon Multimedia Software Corp. I use it daily and it works great. We are using Tracker.Net for healthcare workers following ToolBook courses and it seems to have great potential. I'm dead impressed with what I've seen so far with Tracker.Net. I think you could have a real winner here. I have spent several tens of hours trying to source alternatives to Tracker (just to see what's out there and how it compares). Without exception, the products on offer are overblown and overpriced. And the customer service is non-existent. None of the airlines I deal with would be prepared to pay the 10's of thousands per year that the likes of [the big LMS's] require and perhaps more importantly even big companies like this can't be bothered to get their heads around such complicated systems.